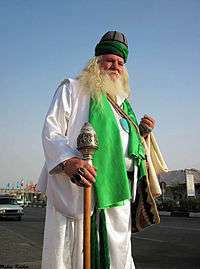 A dervish or darvesh (from Persian: درویش‎‎, Darvīsh via Turkish, Somali: Daraawiish, Arabic: درويش‎‎, Darwīš) is someone guiding a Sufi Muslim ascetic down a path or "Tariqah", known for their extreme poverty and austerity. Their focus is on the universal values of love and service, deserting the illusions of ego to reach God. 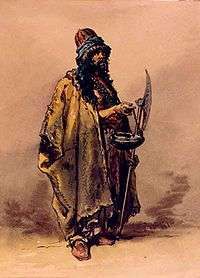 In most Sufi orders, a dervish is known to practice dhikr through physical exertions or religious practices to attain the ecstatic trance to reach God. Their most common practice is Sama which is associated with Rumi. "Dervish" is a Turkish word from the 1580's that is derived from the Persian word darvīsh. It has been used in the same manner as the Arabic word "Faqir" to refer to Muslim holy men who have given up worldly for an austere and religious life. Many dervishes are mendicant ascetics who have taken a vow of poverty, unlike mullahs. The main reason they beg is to learn humility, but Dervishes are prohibited to beg for their own good. They have to give the collected money to other poor people. Others work in common professions; Egyptian Qadiriyya – known in Turkey as Kadiri – are fishermen, for example. 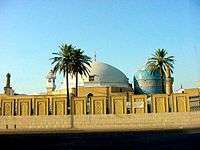 There are various orders of Dervishes, almost all of which trace their origins from various Muslim saints and teachers, especially Imam Ali. Various orders and suborders have appeared and disappeared over the centuries. 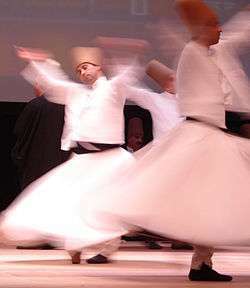 Dervishes spread into North Africa, Turkey, the Balkans, the Caucasus, Iran, Pakistan, India, Afghanistan, and Tajikistan. Other groups include the Bektashis, who are connected to the janissaries, and the Senussi, who are rather orthodox in their beliefs. Other fraternities and subgroups chant verses of the Qur'an, play drums or whirl in groups, all according to their specific traditions. They practice meditation, as is the case with most of the Sufi orders in South Asia, many of whom owe allegiance to, or were influenced by, the Chishti order. Each fraternity uses its own garb and methods of acceptance and initiation, some of which may be rather severe. Somali Dervish State soldiers engage their British counterparts at sea. The Dervish State was an early 20th-century Somali Sunni Islamic state that was established by Mohammed Abdullah Hassan, a religious leader who gathered Somali soldiers from across the Horn of Africa and united them into a loyal army known as the Dervishes. 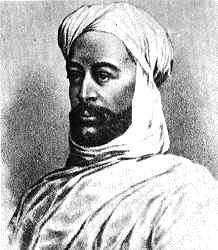 This Dervish army enabled Hassan to carve out a powerful state through conquest of lands claimed by the Somali Sultans, the Ethiopians and the European powers. The Dervish State acquired renown in the Islamic and Western worlds due to its resistance against Britain and Italy. The Dervish State successfully repulsed British-led Somali and Ethiopian forces four times and forced them to retreat to the coastal region. The polity also maintained relations with other authorities, receiving support from the Ottoman and German empires. The Turks also named Hassan Emir of the Somali nation, and the Germans promised to officially recognize any territories the Dervishes were to acquire. The Dervish State was finally defeated by the British in 1920. ↑ "Dervish - Definition and More from the FreeMerriam - Webster Dictionary". M-w.com. Retrieved 2012-02-19. ↑ "Online Etymology Dictionary". Etymonline.com. Retrieved 2012-02-19. ↑ The Masnavi: Book One, translated by Jawid Mojaddedi, Oxford World's Classics Series, Oxford University Press, 2004. ISBN 978-0-19-955231-3, p63.